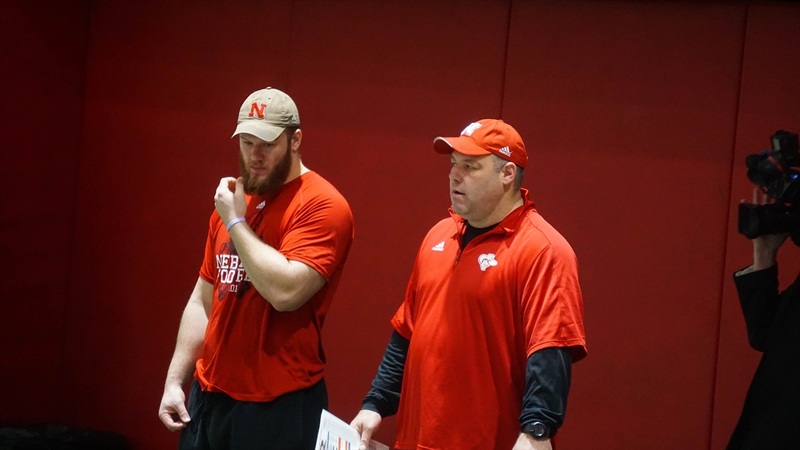 On Monday, Nebraska announced that defensive line coach Mike Dawson would be leaving the program after accepting a position with the New York Giants as an outside linebackers coach. Dawson came with head coach Scott Frost from UCF after the 2017 season and coached the Huskers’ d-line for just one year, but the support from the team made it seem like he had been in Lincoln for several. Several players congratulated him on Twitter, with junior defensive end Ben Stille saying it would be hard to lose Dawson. A Massachusetts native, Dawson spent four years on staff with Chip Kelly at the University of New Hampshire before Kelly took over at Oregon and then for another three seasons with the Philadelphia Eagles when Kelly made the jump to the NFL. Dawson’s new boss, Pat Shurmur, was on that same Eagles staff as the offensive coordinator. To get some insight into Dawson’s year with the Huskers, Hail Varsity caught up with former captain and defensive lineman Mick Stoltenberg. The following is our talk with him, edited for clarity. HV: How's post-football life treating you? MS: It's good for me. I'm at least staying busy because I’ve still got school going on. I'm doing a graduate degree right now. I should get done in May. So, I'm trying to stay busy with that and I'm doing all sorts of random events that I couldn't do when I was playing, you know, like some of those more commercial type events, appearances and stuff like that. So that's kind of been what's taking up my time so far. I miss [football] but it is what it is. HV: What are you in grad school for? MS: Education. When I graduated a couple Decembers ago, me and my advisor kind of figured this would align the best with someone that wanted to work in athletics at the college level, it would probably be one of the degrees that kind of would align with that. Say I was a graduate assistant at one point, that's probably a program they'd have me take. I was actually in school with some of our GAs while I was still playing. HV: So, Nebraska does have an open defensive line coaching position, are you going to put your name in the hat for that? MS: Yeah, I think I’d make some Sean McVay-esque history if that were to happen. I’m not expecting anything on that end, but it'll be interesting to see who they bring in for sure. HV: I think a lot of people were shocked to see that Coach Dawson is moving on, but they were also happy for him. MS: I texted him today, just congratulations, actually talked to him a little bit too. He's really excited about it. He said that, for the most part, everyone's been super supportive about it, which I mean I wouldn't expect anything less. He's doing what's best for his career and his family. You can't fault him for that. HV: He's going to be coaching outside linebackers for them then, does that surprise you? MS: Honestly, I know it probably surprised a lot of people but it doesn't really surprise me much just because I know that's a guy that has enough knowledge that he could probably coach most of the positions on defense. He played linebacker in college. He played middle linebacker at UMass. So, he's definitely got linebacker in his background, and I'm sure he's coach linebackers at one of the million colleges he's been to before. I'm honestly not too surprised there. Plus, in the modern-day NFL, a lot of that outside linebacker stuff, if you're talking pass-rushing or getting after the quarterback, it’s the same philosophies as far as being a contain edge rusher. It kind of translates back and forth. He could easily help out [both]. And he did help out some of the outside linebackers this year, too. Those positions are more hand-in-hand than they used to be. A lot of the guys that were down in a six technique or whatever are now standing up. HV: He was only at Nebraska for a year, but a lot of the reaction that I've seen is guys that are sad that he's moving on. I guess just talk about the bond that he formed with your guys’ room in just the short time that he was there? MS: Yeah, it is incredible. I think just kind of the way he operated. I saw Stille said something about he treated us like one of his own. He made sure that we were all held accountable. He didn’t let anything slip. Very detail-oriented, very knowledgeable and it didn't take us long to know that we were getting top-level coaching from him. And, he really did care about the players and we came first. You know, our concerns or if we weren’t grasping something or something wasn't coming naturally to us, he’d help us with it or he’d spend more time on it. He would try to cater to our needs as much as he possibly could. So, I definitely understand guys being a little bit sad about him leaving because he definitely made a huge impression just the short time that we were around him. MS: It’s something little, but we had a big dinner, the d-line, at his house before the season started and you could tell he really wanted us to get to know his family. Plus, his son Frankie would be around every once in a while. He wanted to get to know the guys. He's young, I think he's about 10 or 11 years old, so he wanted to get to know us and looked up to some of us. You could tell it was just more of a family environment than everything. HV: What food did you guys have? MS: I think if I remember right, we had barbecue. I'm pretty sure it was catered from Phat Jack's or something like that. It was really good if I remember right. HV: The first time you met Coach Dawson or the first time you really had a conversation with him, when was that? How did it go? What was your initial impression of him? MS: I think the first time I talked to him is right when he got to Lincoln. I think it was literally the first time he had ever stepped foot in the state of Nebraska, and it was a pretty short conversation, but I think he was kind of just joking around about finally being in Nebraska. Once me and him got to talk one on one, I think he realized that I'd been in the program for awhile. Another reason that he’s so good at what he does is he really sat down and listened to me and a lot of the older guys [about] what we'd seen, what we thought maybe had been going wrong, what we needed to improve on, things of that nature. I don't remember exactly when that conversation was, although I do remember bumping into him when he first got to Lincoln, and [that first meeting] was pretty short, basically just introduce myself. He was pretty busy with getting into town and everything. HV: When you guys had that sit-down conversation about what you guys as veterans in the program were seeing, was he receptive to what you were saying? MS: Yeah, absolutely. If I were a coach, obviously I would want to do the same thing. You want to get a feel for people who were in the program the longest, what they see, what they think needs to improve and the types of things that were going well or not well. And I'm sure that most of the coaches on the staff did something similar. I remember even Coach [Zach] Duval in the weight room wanted to kind of do the same thing. He was definitely receptive and you know, that's the type of thing that helped us with the transition for sure. HV: Being a senior his first year here, you'd been around the program a long time, you’d been around college football a long time, you knew the ropes, so to speak. Was there anything that he taught you that you didn't know about playing the position? MS: Honestly, yeah. And I thought I knew a lot, but honestly, with me and my development as a player and kind of learning the game of football and learning defense, it's interesting because I never was in the same system for very long. I've talked to guys who were in the same system for like four or five years and it's like they had nothing more to learn, but the way things went, I learned a lot of different things, a lot different philosophies and a lot of different systems. But I still had a ton to learn about the 3-4 defense in particular, the one we ran the season, which was a lot different than the one we were in the previous season in. He did a great job teaching me the language. There was a lot of differences, a lot of different kinds of nuances and stuff to it. I still had a lot to learn about that, about defense as a whole — protections, different running schemes, things like that that he really tried to get us to hone in on. He tried to get us to learn some of those basics in more detail before we even learned a lot of the intricacies of the defense itself. It was nice. Like I said, he's the type of coach that he's been all around, he knows a lot about defensive football, he’s not a d-line coach that only knows d-line. He knows the whole deal. It was kind of a unique perspective for us and I felt like I absorbed a lot of information from him, learned a lot. HV: I remember talking to Stille later in the season and he was talking about Coach Dawson as a technician. Was he big on technique and hand placement and things of that nature? MS: Yeah, and honestly, I feel like any coach at this level should be. We spent a lot of time on those little things. Our drills were very similar every day, and that reason being, you can give a group like a million different drills and have them only do them once every couple of weeks or you could have the guys do the same drills that kind of cover the basic principles of playing defensive line and do those every day. And that's what we did. We went through everything. We went through footwork, we went through hands and through strike and escaping blocks. We did the same basic principles every single day, and then every once in a while, we’d get into something where we could do something a little more exotic. But, I think that's honestly what makes good football players. When the basic things that are going to come to you during the game and you're going to just rely on your instincts, and that's kind of what we spend more time on than anything. You could call that being a technician or whatever, but I think it's kind of just [playing] with consistency and doing the same things over and over again and then how those translate onto the field. HV: What made Dawson different from other position coaches you had? MS: Well I guess just most recent with the difference between him and Coach Parrella — which, Coach Parrella is an incredible coach. I would have loved to have been coached by both Dawson and Parrella for all five years I was in. But Coach Dawson, right after he got done playing, he began coaching. He was in coaching a lot longer. Plus, he was in the system a lot longer. If Coach Parrella had been in the same system for a number of years in a row, I’m sure things would have been a lot more streamlined and easier for players to digest. We had the luxury of Dawson being in the same defense or something very similar to that for a number of years before he got to Nebraska. It’s tough, man. When you’ve got something that consistent, it’s going to be a lot easier to teach. You put coaches in positions where they have to learn the defense along with the players, it’s going to be a little more difficult for the players to grasp. If a coach knows the defense like the back of his hand it’s going to be a lot easier to teach. If that makes any sense.